Last week, there was a big development in the long-running, bitter, complicated battle over a 9,000-year-old set of bones known variously as "Kennewick Man" or "The Ancient One," depending on whom you ask. The U.S. Army Corps of Engineers confirmed that the ancient bearer of the bones is genetically linked to modern-day Native Americans. Now, under federal law, a group of tribes that has been fighting to rebury him will almost certainly get to do so. It also means that scientists will probably never get another chance to study him, though ancient human remains from North America are incredibly rare, and forensic technology gets better all the time. "It's the chafe between science and spirituality," writes Kevin Taylor at Indian Country Today, "between people who say the remains have so much to tell us about the ancient human past that they should remain available for research, versus people who feel a kinship with the ancient bones and say they should be reburied to show proper reverence for the dead." There's a history to bitter tensions of this sort. Take the recent fight between native Hawaiian protesters and scientists who wanted to erect a telescope on Mauna Kea, a dormant volcano considered sacred by some and "the best location in the world to observe the stars and study the origins of our universe" by others. None of these clashes exists in a vacuum; they often come on the heels of decades, if not centuries, of genocide and erasure aimed at indigenous peoples and their ways of life. And so an object of scientific interest, be it a bone or a mountain, can come to stand for an entire civilization. Some say scientists need to rethink their whole approach to culturally sensitive research. Others say the unfettered pursuit of knowledge ought to trump belief; if the faithful always got their way, we'd still think the Earth was flat. Who gets to decide? 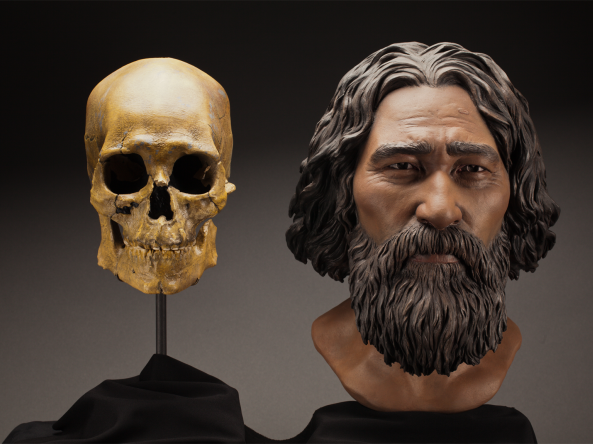 The twists and turns in the story of Kennewick Man — which has been told before, and well — suggest there's no easy answer, of course, but certainly provide an incredible case study for the future of this debate. A forensic mystery, or a moot point? The fight has been raging for 20 years, ever since a couple of college kids stumbled — literally — across a human skull while wading in a river in Washington state. They thought they'd found a murder victim, and flagged down a nearby cop, who called in a local expert. Instead, they had discovered some of the oldest, most complete human remains ever dug up in North America. Archaeologists dubbed the skeleton Kennewick Man, after the place he was found, and hoped his bones could help settle one of the greatest mysteries in the story of human migration: how did Homo sapiens, originating in Africa, end up in the Americas? The dominant theory was that humans trekked here on foot around 13,000 years ago, during the Ice Age, when seas were lower and a land bridge temporarily connected Siberia and Alaska. But other evidence suggests humans were already living on this continent well before that particular pathway was possible. So which was it? Did humans walk here, or somehow — incredible to imagine — paddle? Was there one wave of migration, or more? A study of Kennewick Man's bones could reveal what he ate, what he drank, how he hunted, and, of course, his DNA — all clues that could ultimately tell the story of where he, and his forebears, came from and how they got here. But a group of Native American tribes considered The Ancient One, as they call him, a direct tribal ancestor — and they didn't need science to explain how people ended up here. "From our oral histories, we know that our people have been part of this land since the beginning of time," a leader of the Umatilla tribe wrote in a statement at the time. "We do not believe that our people migrated here from another continent, as the scientists do." Working together, five tribes demanded that The Ancient One's remains not be poked or prodded in the name of science, and instead be promptly reburied in accordance with tribal custom — and under the Native American Graves Protection and Repatriation Act. That federal law, passed in 1990, requires certain Native American artifacts and remains to be handed over to culturally affiliated tribes or provable descendants. "The tribes had good reason to be sensitive," writes Smithsonian Magazine's Douglas Preston. "The early history of museum collecting of Native American remains is replete with horror stories. In the 19th century, anthropologists and collectors looted fresh Native American graves and burial platforms, dug up corpses and even decapitated dead Indians lying on the field of battle and shipped the heads to Washington for study. Until NAGPRA, museums were filled with American Indian remains acquired without regard for the feelings and religious beliefs of native people." But for these bones to fall under the protection of NAGPRA, there had to be proof of a connection between the remains and the people fighting to reclaim them today. The scientists said no such connection existed. The tribal leaders insisted it did; they could feel it in their bones. That question ended up spawning an unprecedented legal and ethical battle in which prominent archaeologists and anthropologists would sue the U.S. government for the chance to study the bones. Femur bones would go missing under unexplained circumstances. Bitter arguments would be pitched over the migration patterns and feeding habits of sea lions, the curvature and racial implications of cheekbones, the validity of oral tradition as courtroom evidence. "Kennewick Man spent a lot of time holding something in front of him while forcibly raising and lowering it; the researchers theorize he was hurling a spear downward into the water, as seal hunters do. His leg bones suggest he often waded in shallow rapids, and he had bone growths consistent with 'surfer's ear,' caused by frequent immersion in cold water. His knee joints suggest he often squatted on his heels. ... Many years before Kennewick Man's death, a heavy blow to his chest broke six ribs. Because he used his right hand to throw spears, five broken ribs on his right side never knitted together. This man was one tough dude." As of last week, it's likely that this tough dude is headed back to the earth. University of Chicago scientists confirmed another study, from last year, showing that Kennewick Man's DNA has genetic similarities to those of modern-day Colville tribal members. Now, members of the Colville tribe and four others say they'll work together to complete the repatriation — or reburial — process, and the government has shown zero interest in standing in their way. But while scientists may never get another chance to study these remains, even as biomolecular science is "advancing so rapidly that within five to ten years it may be possible to know what diseases Kennewick Man suffered from and what caused his death," writes Preston, the story of Kennewick Man raises all sorts of questions as to how researchers might avoid antagonizing local cultures to begin with — or whether they should have to try. "Many other researchers are taking a similar approach. [Dennis O'Rourke, a biological anthropologist at the University of Utah in Salt Lake City] says that there is no one-size-fits-all strategy to working with native communities. He finds some of the North American Arctic groups he works with eager to contribute to his research, others are less so; and their opinions shift over time.
" 'We really have to change the top-down approach, where we come to people and say "these are our research questions and you should participate, because — SCIENCE," ' says Jennifer Raff, an anthropological geneticist at the University of Texas at Austin." "The politics of bone gathering in Africa are notorious ... and one shudders to imagine what might happen if activists could convince modern Africans to claim early human skeletons as their ancestors, so that they too could be reburied." "Just weeks before Kennewick Man's remains were discovered, researchers working in Alaska discovered a 10,000-year-old human skeleton. They notified local tribes and quickly came to an agreement that allowed them to excavate and study the remains and keep the tribes involved in the research. 'You don't really hear so much about the good cases,' says Raff."